It's more positive than your average commercial, but still fosters an unhealthy relationship between people and consumerism. What should we be allowed to expect from brands, and what should they be allowed to expect from us? And then a voiceover asks us: “Is this the best a man can get?” — playing on the multibillion-dollar razor company’s famous slogan. It’s not a rhetorical question, as it turns out. 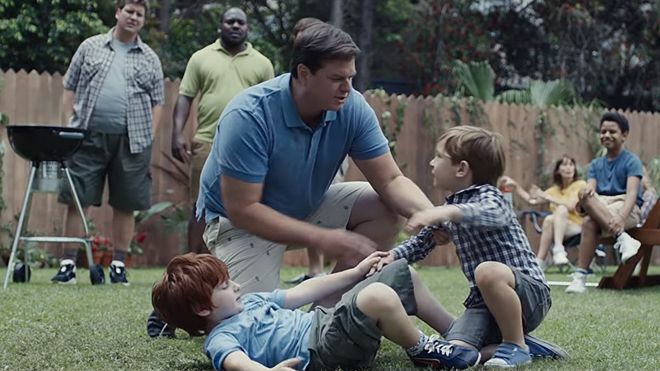 The ad then pivots to more positive depictions of masculinity. Dads breaking up fights. A man chiding his friend for ogling a woman. A father hoisting his daughter up to the mirror for her to say “I’m strong!” Terry Crews, always a welcome addition to any conversation around masculinity, makes an appearance. Innocuous stuff, one would think, but these are not innocuous times. In an age wound as tightly as our own, it’s perhaps inevitable that even a message with all the political charge of a Saturday morning cartoon PSA would be interpreted through a partisan filter and assigned a team in the culture war. Plenty of men on Facebook, YouTube, the comments on this very website and the unending catastrophic discourse of Twitter slammed the ad as anti-man, labeling it a misandry-fueled screed. The Gateway Pundit called it a “Man-Hating Campaign.” Piers Morgan said Gillette was “eager to fuel the current global assault on masculinity.” If you’re feeling brave, check out the #BoycottGillette hashtag on Twitter, but I’d get a hot shower running first if I were you. Not to put too fine a point on it, but men who complain this way about the Gillette ad are being patently absurd. This ad takes aim at behavior acknowledged universally as trash and then goes out of its way to provide better, more positive examples of manhood. It’s both a criticism of men who engage in toxic behavior or stand idly by while it happens and an encouragement to be better. Don’t let your friends sexually harass women. Don’t be a bully. These are things almost every man has heard before from a parent, a teacher, a pastor or a mentor. Whether or not they’ve internalized it is up for debate, of course. But now this message is coming from an ad, and that does put an admittedly cynical spin on things. Ads sell you things. That’s their job. When Gillette declares itself to be “the best a man can get,” they’re pitching you on the product and asking you to buy their razor. That’s how the relationship between us and commercials works. This is correct, as far as it goes. Consumerism is the driving force in our culture, and that gives brands an immense amount of power in how they shape our world. But should we then demand that brands use that power responsibly? Or is it wiser to interrogate whether or not they should have that level of influence at all? Historically, most brands have wielded that power disastrously, particularly as it relates to women. It has pushed women to be skinnier, smoother, shinier, tinier, tanner, you name it, and wreaked untold havoc on the emotional development of women who are bombarded by thousands — literally thousands — of ads every day reminding them that they’re not what they should be. But all this has taken on a new sheen, thanks in no small part to the election of President Donald Trump. As consumers have become more socially engaged, brands have attempted to make the shift with them, equivocating buying their product with being on the right side of history. This has been sometimes awkward (remember Pepsi’s infamously stupid Kylie Jenner-starring ad?) and sometimes stirring, as when Nike named Colin Kaepernick the new face of its “Just Do It” campaign. Brands like Nike, Gillette and even Pepsi do influence culture, so this new generation of socially conscious ads may well represent an improvement over ones that explicitly objectify and demean us. But these ads also represent that shift Gillette made — from asking us to buy something to asking us to be something. In that sense, it’s a power move for advertising companies that gives them even more influence over our culture and a bigger say in our own perceptions of human dignity. That dignity has been bestowed on us by God, and any outside attempt to shape it should be viewed with suspicion. A morally healthy society would not need to look to multi-billion dollar companies for cues on what kind of people we ought to be. An intellectually robust person is rightfully suspicious of any salesperson’s pitch, particularly when that salesperson hails from one of America’s one hundred biggest brands. And a spiritually engaged generation that really wants to heal masculinity from its distressingly wicked state would make a responsible distance from consumerism part of the prognosis. In a neutral context, the message of Gillette’s ad is a good one, and there’s nothing wrong with feeling encouraged or inspired by it. And if men are feeling angry and uncomfortable about the things “We Believe” is telling them, that says a good deal more about them than it does about Gillette, and they need to consider that are being exactly the sort of thin-skinned, hyper-reactionary, offense-seeking “snowflakes” (ugh) progressives are always accused of being. But there is another, deeper layer here that should be concerning. As brands jockey for influence, they’re wading into complex arenas, looking to leverage a winsomely benign take on things like gender and racial equality to move a product that does not seem to have much at all to do with such issues. There are undoubtedly people working in these companies with opinions on these issues that are genuine and praiseworthy, but marrying those opinions to carnival barking represents consumerism’s continuing invasion of what it means to be a person. In the series finale of Mad Men, our not-hero advertising executive Don Draper gets away from it all at a little commune in California where he attempts to ohm himself into a sense of wholeness. And it sort of works, as west coast hippies help him make peace with the mess he’s caused of his life. But then in the middle of a meditation session, he has a lightbulb moment: this could be a TV commercial. Cut to Coke’s iconic “It’s the Real Thing” ad, which packaged the very real 1960s desire for global peace in a tempting lie: soda is part of the deal. This always part of Don Draper’s genius on Mad Men: translating real human needs into really good marketing campaigns, and convincing consumers that the deepest desires of the human heart can be fulfilled with things. But it’s a lie. The problem with brands isn’t just that they’ve been delivering negative moral messages, it’s that we’ve been looking to them to deliver any moral messages at all. We can be clear on the fact that two things are true here. The first is that the message of Gillette’s ad is a positive one, and if you have to sell razors, there are much worse ways to do it. But the second is that giant corporations are not to be trusted with the moral development of a society, and the best thing they can do to correct our culture’s much-needed shift away from consumerism is get out of the way. Once we learn how to put brands and advertisers in their proper place, we can really get down to being the best we can be.